I’m all out of this PCB at this time. Not sure if I will be, making any more. I’m working on other projects. This is PCB I developed to speed up the process of making effects pedals. It incorporates all of the standard wiring for the in/out jacks, DC power with a reverse polarity protection diode and stompswitch. It also provides a perfboard area for building your effect. It’s designed to drop into a “B” sized box and leave room for a 9V battery. I found I was spending as much time wiring jacks and the stompswitch as I was soldering parts on the board. Having jacks and switches on wires also made it tough get an effect in and out of a box for modification and trouble shooting. I also found I was often putting projects into a larger box than necessary to accommodate all of the extra wiring. The PCB streamlines the process of creating an effect. It fits into a standard “B” sized box leaving enough room for a 9V battery. Saves time and energy by providing all of the standard wiring. It makes the process of assembling boxes extremely easy, since the PCB and all the parts just drops in. I have built many projects with PCB. Take a look at the projects on my site. If you are interested in trying this out for yourself the boards are $4 each. Send me an email or post a comment here. 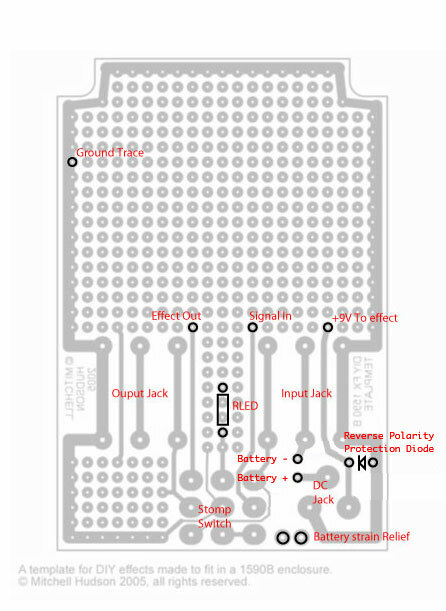 Here’s a diagram showing the base setup with the template PCB. Not this is a view from the top as if you were holding the board up to the light and seeing a silhouette of the traces. Boards measure 56 by 83mm. Here’s how you might set up an indicator LED. Here’s a link to a drilling template. Note this is a preliminary template. The last box I drilled was a little off. This could have been poor alignment of drill or template or other operator error. Be sure to drill holes a little smaller than they appear on the template and make adjustments with a round file or a hand reamer. This is what I do on every box. The two pictures at the bottom don’t work. They both 404. Cant wait to get going on my next build! Can you tell me the measurements of that board? Inches, mm, whatever. The boards measure 56 by 83 mm. Or very close to that. Let me know if you have any more questions. how about a tonebender layout with a blend control? I have been thinking about building a Tonebender and Fuzz Face. I just haven’t had the time yet. I’ll some time after Oct. I have a layout for Frank Clarke’s Hot Harmonics. It’s half built at this point. So it is un-confirmed. I could post it if you want to give it a try. When I finish it I’ll definitely post it. This project has been getting some traffic on the http://www.diystompboxes.com/ forum lately. I’m down to about 30 PCBs. Mouser lists the power jacks (P/N: 16pj031) as obsolete, but if you search for that part number it says that there is an RoHS version available. Mouser changes part numbers some times. It’s hard to keep up I’ll try and update things when I find some time. Usually they will suggest a compatible replacement. Im somewhat new to effects building. How big are the pots you use in the effects that require three pots (like the Shiva Sonic pictured above), where do you get them from, (and if it is not too much trouble) do you have a part number for one? Thank you for sharing your time and information, your website has been helpful to me. Your idea for the template is great – I’ve wondered if there was an easier way, looks like you are on to something with this. Another thing would be to add at the top the connections for the pots (PCB type). That way you could eliminate their wires too. I have those kind of pots, I get them cheap from futurlec, slow shipping but good prices all around. How may pcb’s do you have left? Not to sure if you got my email. are you still selling the PCBs? I’m all out of PCBs. I don’t think I will be making any more. Question: How do you build these PCBs? Are you etching them yourself or bulk ordering to some PCB prototyping company? Are you still selling them?…. I would love to try the concept, but not willing to build 100 pcbs now. Did you ever make any more PCB’s as I would like to build one. 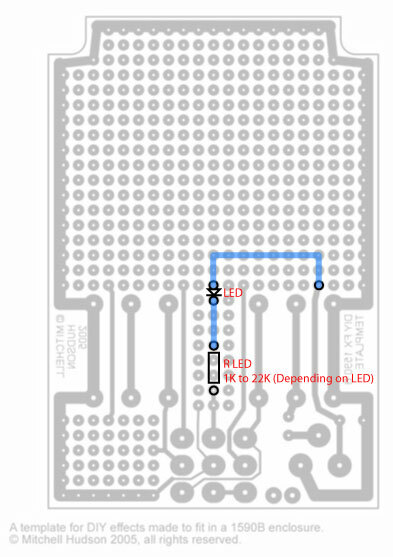 If not is it possible that there’s a schematic available so I could prototype a board myself. Do you have the Gerber file available so that I can have some of these printed? Is it okay if I use these for my own commercial products? Recognition will be made clear in the write-up on every pedal. 16pj031 DC jack seems to be unavailable. is this DC jack a compatible replacement part ? Yes, looks like that would work. Hi, I see that you are not producing these boards anymore, is there any chance that you could send me the to-scale images or files so that I could modify them to do something similar for myself? 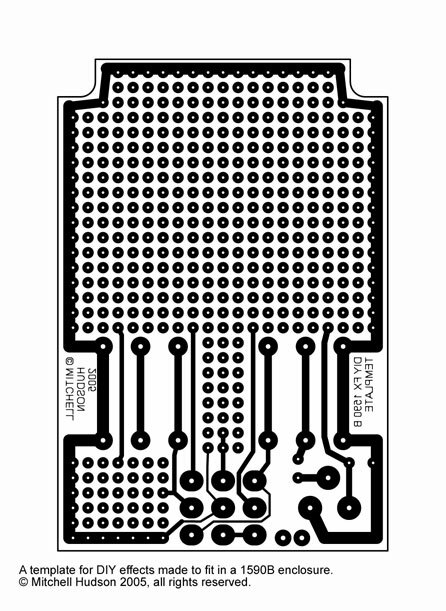 I’ve not produced a PCB before so I’m looking for a great starting point.